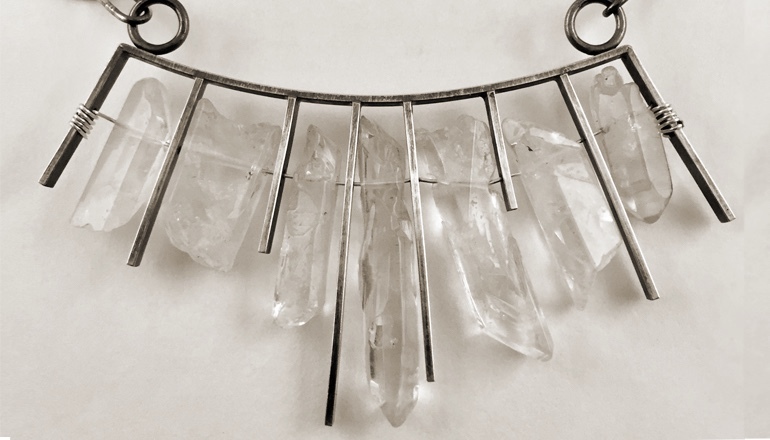 5 quartz crystal points hang from asymmetrical, arched, sterling silver frames, suspended by a delicate sterling silver wire-wrap. Each pendant is centered between two lengths of handmade Argentium silver chain. Each link is soldered closed to insure strength and durability. The over all length of each necklace is 18 inches. The pendants measure roughly 2 ½ inches wide and between 1 1/2 and 2 1/2 inches long. Please specify which necklace you wish to purchase by including the letter in the picture in the note to artist section at check out.